Today I have another post from the Secret Recipe Club! The blog assigned to me this month was deli-cute-essen, which consists of all Vegan recipes. Neither Chris nor I are Vegan, so a lot of the ingredients were unfamiliar to me. I decided to try out these Snickerdoodle Ice Cream Sandwiches since they looked so delicious. I chose to alter the original recipe a little (i.e. I used regular milk instead of soy milk), but I was surprised how awesome this recipe turned out! Who knew Vegan recipes could be so delicious? And could include something awesome like an ice cream sandwich?! Before reading this blog, I was kind of ignorant about all the different types of dishes that can be made using Vegan ingredients. There are so many different substitutes that I never would have been aware of otherwise. For example, in this recipe instead of eggs, you whip together (soy) milk and cornstarch. It still gave the cookies a great consistency and I couldn't even tell the difference! I definitely suggest taking a look at this blog even if you don't follow a Vegan diet. There are so many recipes that are very healthy and look delicious! Enjoy! The cookies were really great by themselves, too! In a large bowl, cream the butter and sugar together until smooth. Add the vanilla, and the cornstarch/milk mixture, and beat until well-mixed. In a smaller bowl combine the flour, baking powder, salt, and cornstarch. Stir this into the wet ingredients and combine well. Begin rolling the cookie dough into balls of about 3 tbsp. each and place on an ungreased baking sheet. Using the bottom of a glass, press down on each ball until they are about an inch thick. If you would rather roll out the dough and use cookie cutters to cut out shapes, sprinkle flour on a flat surface and use a rolling pin to roll out. Combine 2 tbsp. cinnamon and 4 tbsp. sugar and sprinkle over cookies. Place cookies on an ungreased cookie sheet. Bake for 12 - 14 minutes, and no more. The cookies should still seem very soft when you remove them from the oven. Let cool on the pans for about 10 minutes, and then transfer to a wire baking rack and let cool completely. Allow the ice cream to soften slightly. Spread it into an even layer about an inch think in a pie plate. Put it back into the freezer to set while making the cookies. Once the cookies are cool take the ice cream out of the freezer and using the same size cookie cutter, cut circles out of the ice cream. Lift them out using a small spatula and place the ice cream circle between two cookies. Press down slightly and wrap in wax paper. Put into an air tight container or ziplock bag in the freezer. Continue until all cookies and ice cream are used. 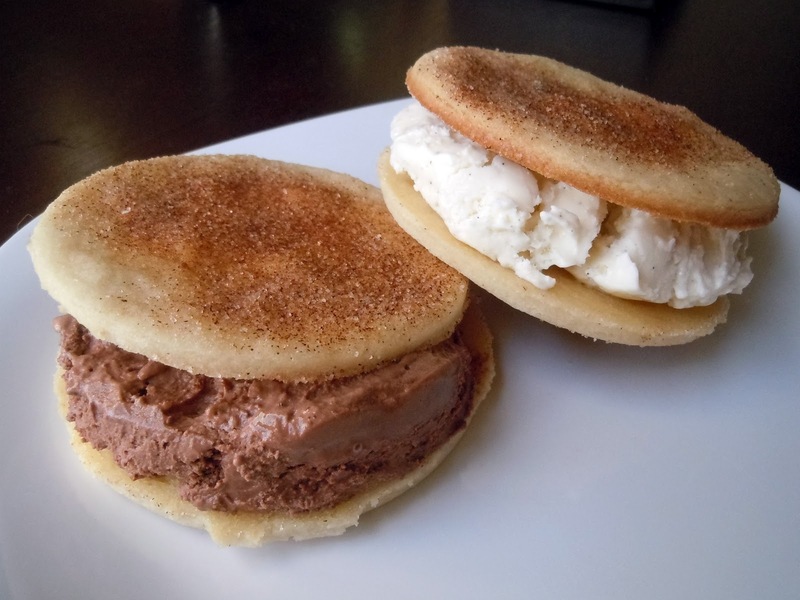 Great job on these Ice Cream Sandwiches.. Who doesn't love snickerdoodles...and add ice cream? Yes, please! Well done working out of your comfort zone for SRC and making these work for you. This is over the top. Most of what I have seen in this month's reveals have been savory dishes! This is a great sweet concoction! I am so glad you liked the (vegan) recipe. I was addicted to these all summer. And thanks for the lovely comments. 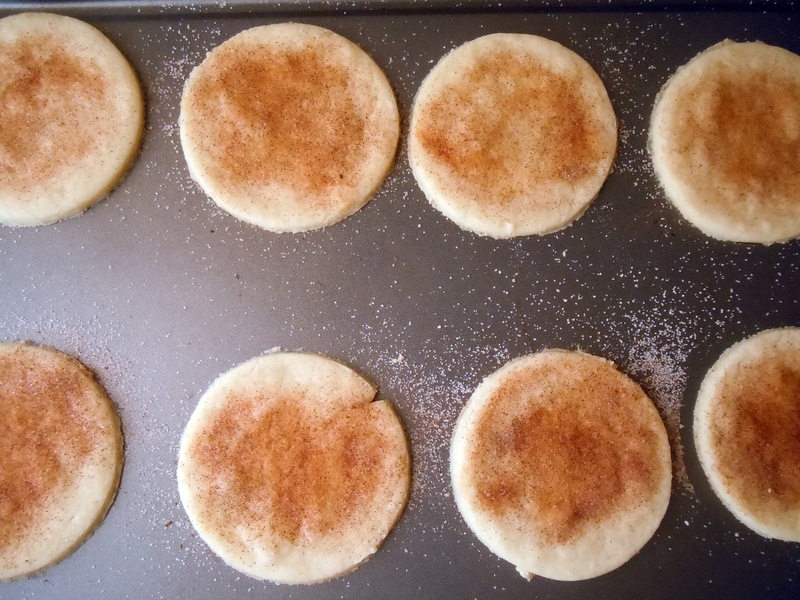 I made Snickerdoodles last night with my grandkids if there were any left I would fill them with ice cream--great idea. They look delicious. Great SRC post. Have a great week. What a fantastic idea! Snickerdoodles are one of my favorites and as an ice cream sandwich - simply perfect. Glad to be part of SRC group C with you! I got a vegetarian site this month also (not quite vegan), it was a great experience for me too. What a great SRC pick! So happy to find this recipe and your blog. I never thought to make snickerdoodle ice cream sandwiches! Yum! I'm always on the lookout for vegan sweets for my daughter, great recipe. What a great idea! I LOVE snickerdoodles and never thought of using them for ice cream sandwiches. :) Great choice for SRC.